TORONTO (CP) - Prime Minister Stephen Harper is backing his foreign affairs minister's decision to deny a passport to Abdurahman Khadr, the son of a suspected al-Qaida financier. "Minister (Peter) MacKay has taken his decision based on national security according to his powers and responsibilities," Harper said Wednesday. "Mr. Khadr has the right to appeal that decision.
" Reports Wednesday that MacKay refused a passport to Khadr even though a Federal Court judge ordered Ottawa to stop denying him his travel document. Khadr, 23, is a Canadian citizen who was captured in Afghanistan in 2001 and held for months as an enemy combatant by U.S. forces at Guantanamo Bay, Cuba. He was released in 2003, but only after he agreed to spy for the United States. He has been denied a passport by the Canadian government despite never being charged with any crime. 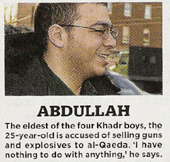 Khadr is the second eldest son of Ahmed Said Khadr, who was killed in a firefight with Pakistani forces in 2003. The Khadr family has provoked intense debate in Canada. Each of the five siblings, all of whom are Canadian citizens, has at one time or another been separately accused or investigated for alleged links to terrorism. On June 8, the Federal Court found that Abdurahman Khadr was entitled to the "fairness and legitimate expectation owed to all Canadian citizens" in terms of applying for a passport. Ottawa was told it had used dubious grounds to deny him a passport, and was ordered to cease doing so. The decision allowed Khadr to reapply for his passport, but stopped short of entitling him to a new one. Khadr's lawyer, Clayton Ruby, was unavailable for comment Wednesday, but has expressed disappointment over Ottawa's decision to deny his client a passport. holy war, infidels and the Internet, movie scripts and martyrdom Kareem Khadr is kneeling on the living room carpet, a short crawl from his wheelchair. He is barefoot, dressed in a bright yellow soccer T-shirt BRAZIL -- and a pair of beige shorts that expose his limp, crippled legs. His mother and sister are sitting nearby, talking to one another as he flips, page by page, through a pile of old photo albums. Every so often, he interrupts their conversation to point and smile at a specific snapshot from the past. His father. His brothers. Afghanistan. complex in east end Toronto. Inside the main room, a light brown couch, second-hand, sits near the balcony window, right beside a matching chair and small flat screen television. Most of the walls are lined with colour posters, each of a different mosque. Near the front door, on the opposite side of the kitchenette, a narrow hallway leads to three tiny bedrooms and a bathroom. Depending on the day, up to six people sleep here. "We look like sardines," says Zaynab, Kareem's 26-year-old sister. At 17, Kareem is the youngest of the four Khadr boys, the obedient son who -- at age 14 -- was famously caught in the crossfire when Pakistani troops killed his terrorist dad, Ahmed Said Khadr. Paralyzed from the waist down, Kareem said goodbye to jihad and headed home to Canada, flashing the peace sign to photographers when he landed at Toronto's Pearson Airport on April 9, 2004. And that was the last anyone saw of him. His notorious family was never far from the headlines: his sister under RCMP investigation. A brother in a Toronto jail cell. Another brother locked up at Guantánamo Bay, Cuba. But for two years, Kareem managed to avoid the spotlight -- until a few weeks ago, when he showed up at a court hearing for the so-called "Toronto 17," Canada's alleged homegrown terror cell rounded up by police in June. His black hair long and curly, Kareem sat in the front row, waving at some of his shackled friends while brushing aside reporters. He was dressed like a typical 17-year-old: brown sandals, blue pants and a T-shirt emblazoned with a gun-toting Stewie, the cartoon baby from The Family Guy. "VICTORY WILL BE MINE!" the shirt proclaimed. Two weeks later, Kareem is kneeling on his apartment floor, finished with the photo albums. Until now, he has never spoken publicly about that morning in October 2003, when Pakistani soldiers and Cobra helicopters demolished the rural compound where he and his father were living. One bullet hit his arm; another pierced his lower back and came out the other side. When he tried to stand up and run, his legs wouldn't listen. "There were no muscles anymore," he tells Maclean's. At an age when most teenagers are learning to drive, Kareem cannot venture too far from home without a catheter. He tries to walk, using leg braces and a pair of crutches, but progress has been slow at best. Yet he insists he holds no grudge against his beloved father, a man who could have raised his kids in Canada but chose holy war instead. "I never blamed him," Kareem says. "I'm proud of him. I know I had to be in that spot because there is a reason for it. Almost everything happens for a reason. And I'm still pretty happy that I didn't get paralyzed from a car accident or a gang shooting or something. You know, at least I was there helping my father. I had a cause to be there." A senior RCMP investigator once wrote, in a sworn affidavit, that Ahmed Khadr "created his own 'terrorist cell' and indoctrinated his children from an early age in the values and beliefs of criminal extremists, specifically al-Qaeda." Three years after his death, those children (most of them, at least) remain the apple of his radical eye, railing against the evils of the same Western world that signs their welfare cheques. Despite all the public backlash and all the police investigations, the family is as outspoken and unapologetic as ever -- proclaiming their innocence in one breath and warning of an attack on the innocent in the next. Few Canadians were shocked to learn that some of the Toronto 17 counted the Khadrs among their closest friends. Still, not everything in the Khadr household revolves around jihad. When they aren't blaming the infidels or influencing the next batch of aspiring extremists, the family struggles with the same day-to-day battles as most Canadians. Car payments. Exams. Disobedient children. Sibling rivalry. Their hypocrisy is almost humorous. Zaynab -- divorced with a six-year-old daughter -- muses about martyrdom, then discusses her plans to go to university. Her mother, Maha, complains almost as much about U.S. foreign policy as the fact that Kareem was cut from a wheelchair basketball team. And then there is Abdurahman, the self-proclaimed "cancer" of the clan, the black sheep brother who turned on his father and worked as a spy for the United States. The others can barely stand him, yet, in a typical Khadr twist, he continues to live in the family's crowded apartment. He smokes. He gambles. And he sleeps until noon. Next year, his life story is scheduled to hit movie theatres. Zaynab Khadr answers the door. It is just after 10:30 a.m., a scorching summer morning in Toronto. She is dressed in black, in a head-to-toe burka that reveals only her hands and her dark brown eyes. Her mother, Maha, smiles from the kitchen. She is wearing white, with a matching hijab that, unlike her daughter, reveals her face. The Khadr women don't shake hands with men. But they are courteous and welcoming, as is Kareem, waiting on the carpet in his World Cup shirt. Canadians first met the Khadr family more than a decade ago, when Ahmed Khadr, an Egyptian-born Ottawa engineer, was arrested by Pakistani police in connection with the 1995 bombing of the Egyptian embassy in Islamabad. Authorities accused him of financing the operation, funnelling the cash through a Canadian charity. He denied the allegations, embarking on a high-profile hunger strike that made such ripples back home that Jean Chrétien, then the prime minister, lobbied on his behalf during a state visit to Pakistan. He was released three months later. Next stop for the family was Afghanistan, where all four of his Canadian sons underwent weapons and explosives training. After Sept. 11, authorities froze Khadr's assets, declaring him an al-Qaeda money man and a wanted fugitive. According to the FBI, bin Laden himself personally tasked his Canadian associate with organizing local militia south of Kabul in anticipation of the U.S. invasion of Afghanistan. Of course, his family denies all this. He was a charity worker, they say, a man so dedicated to the orphans and widows of war that he stayed in Afghanistan to help, bombs be damned. "If you run away, what's the point of being an NGO?" Zaynab asks. Seven years ago, bin Laden was a guest at her wedding. Today, back in Toronto, she and her six-year-old daughter live with the rest of her family. During the week, she attends high school classes, hoping to one day go to university. "If we are different, it does not mean we have to be enemies," she says. "You don't have to fear me." Eighteen months ago, the Mounties searched Zaynab's belongings, seizing thousands of computer files, CDs and audio cassettes, some containing "graphic images of an extreme nature." Ironically enough, the RCMP had used Zaynab's own words -- broadcast in a CBC documentary -- to convince a judge to sign the search warrant. On suicide bombers: "I don't have the guts to do that yet." On accusations that her brother, Omar, killed a U.S. army medic before being shipped to Gitmo: "Big deal." On martyrdom: "I'd love to die like that." She remains under investigation "for participation and facilitation of terrorist activities," yet she is fearless, taunting detectives, ever so subtly, from the comfort of her home. "If carrying my father's beliefs -- and I believe that my father had great beliefs and he did not do anything wrong -- is supposed to be poison, then maybe all of us need to have poisoned heads," she says now, sitting cross-legged on the floor. "I am proud of who I am. I don't regret anything that my family or anybody that I knew did. And I am proud that I will stand up for my belief regardless of what anybody else thinks." There was a time, Zaynab says, when her family had nothing against Canada. The Americans were the enemy, the aggressors "muddling in everybody's business." It was the United States who built bases in Saudi Arabia, who invaded Afghanistan and Iraq. Who bomb Muslim children and torture Muslim prisoners. Who unequivocally support Israel. "If anybody ever said something about Canada, we'd all say: 'You know what, we've lived there. People are very nice and the government stays out of things it is not included in and it does not interfere in people's business,'" Zaynab says. "But then all of a sudden, when they started acting the same, what are you supposed to say? They are not the same? But they are killing us." Zaynab is certainly not the only Canadian who disagrees with the country's mission in Kandahar, where hundreds of troops are hunting and killing Taliban insurgents. But she takes the debate to an uncomfortable level, suggesting that Canada, like its U.S. ally, is now deserving of a terror attack. "Everybody reaps what they plant," she says. "If you follow in the steps of the Americans, you will reap what they did." Not that she would ever do something herself. Of course not. But someone might, she says, and Canadians should consider themselves warned. "Violence is not justified, but it should be expected, is what I am trying to say," she explains. "No one likes it, but it happens. And should the Canadians expect it with the strategy that's being taken? They should expect it. Would it be justified or would it be good or would it be nice? No. Would I justify the person doing it? I wouldn't justify the means, but I could justify his reasons." "Get the troops of out of Afghanistan," her mother adds. "Don't declare war in Afghanistan. ""Just go back to who you were 10 years ago," Zaynab says. "Withdraw the troops. Stop being America's shadow. Start being yourself. "Kareem, now lying on his stomach, joins the conversation. Killing civilians, he says, is not the answer. "They didn't do nothing to us. They didn't harm us." "But they are harming people that are our families and are our friends," Zaynab says. "I might be able to hold more pressure than someone else, but someone else might snap." When asked how she would react tomorrow if someone planted a bomb at, say, a large public building, her answer is hardly encouraging. "I would need to know why first," she says. "Even if I told them it was not the right thing to do, I would understand why they did it." Zaynab is not naive. She knows that most Canadians cringe at her every word. How, after all, can someone so thoroughly enjoy the spoils of life in this country -- free money, free health care, free schools -- while implying that the very same country is a prime target for terrorism? "All I want from the Canadians is to get me out of here," she answers. (The RCMP seized her passport in the raid, so she is technically stuck here.) "Hopefully, I see myself out of here as soon as I can, because I don't fit here. I don't fit here, not even with the Muslims. I walk around and I don't feel that anybody understands me or that I can blend with anybody or fit with anybody." AMcDonald's restaurant sits across the street from the Khadrs' building, the golden arches visible from the front lobby. Seven months ago -- Saturday, Dec. 17 -- an RCMP detective phoned the apartment and asked if Abdullah, the eldest of the family's four sons, would mind meeting him at the fast food joint for a few minutes. By then, the 25-year-old had been in Canada for all of two weeks, a free man after spending more than a year in a Pakistani prison and many years before that on the run. He was thrilled to be back, telling reporters that fellow citizens have nothing to fear. "I just want everybody to know that I have nothing to do with anything," he said, sitting in his lawyer's office, wearing a green shirt he borrowed from his cousin. "I am not an al-Qaeda suspect. I was never in al-Qaeda, and I do not support some of their doings." A week later, Abdullah crossed the road and walked into McDonald's, accompanied by his mother and his younger brother, Abdurahman. He had no idea that a judge in Boston had already signed a warrant for his arrest. According to the FBI, Abdullah admitted during his imprisonment that he was an al-Qaeda weapons broker who supplied front-line fighters with thousands of dollars worth of guns, grenades, rockets and explosive material. Authorities say he also confessed to his role in a plot to assassinate Pakistan's prime minister. Mounties arrested him on the spot; when his mother tried to intervene, officers pinned her to the floor. "After they arrested Abdullah, I felt so deceived," Maha says now. "How do you expect me to love or respect or care or even feel anything toward a government that is deceiving me? Why should I care?" "It becomes very difficult for us to deal with," Zaynab adds. "You would say: 'Would that give you the right to do anything?' Eventually, I'm not going to care anymore. Eventually, you are so hurt that you just don't care. "As she speaks, Abdurahman wakes up and walks into the living room, unprepared for what he sees: his brother, sister and mother sitting on the carpet, talking to a reporter. He says hello, but then berates the others for being so blind. He is not your friend, he says. He is a journalist. Then he walks outside for a cigarette, slamming the door behind him. "It's okay," Zaynab says. "It's regular." "We can't get him out," her mother adds. "I have to go to court to get him out, and I don't want to do that because I don't like the courts. I don't like the officers." Abdurahman was always the outsider. 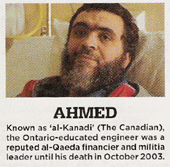 In 2004, when the CBC aired its explosive documentary about the Khadrs, he was the one who admitted that his was "an al-Qaeda family." To the outrage of the others, he told the world about his father's close relationship with bin Laden, and how his dad repeatedly urged him to become a suicide bomber. He also confessed to working as a mole for the U.S. Central Intelligence Agency -- a claim that caught the attention of a Hollywood production company. In January 2005, he sold the film rights for a reported US$500,000. Unlike the rest of his family, Abdurahman is media savvy, a 23-year-old who knows full well how to exploit the press for his own benefit. Last year, when the federal government denied him a passport, he took Ottawa to court -- and invited reporters to come. The day the judge ruled in his favour, he held his umpteenth news conference. "I'll prove that [I'm] the perfect citizen," he said. One journalist asked where he planned to travel with his new passport. Barbados, he answered. Maclean's had other questions for him. Questions about his family. About his future. About rumours that he gambled away a huge chunk of his money. 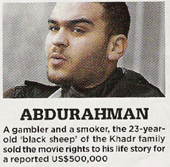 But Abdurahman declined to be interviewed. Not yet, at least. Not until his movie -- Son of Al Qaeda -- reaches the big screen. After reading the script, you can't blame him for keeping his mouth shut. Written by Keir Pearson, the man behind Hotel Rwanda, the screenplay portrays Abdurahman as nothing less than a Hollywood hero, an intelligent, compassionate young man who rejects radical Islam and happily helps the Americans track down the bad guys. He drives fast, drinks vodka and takes his new colleagues on a "five-star tour" of al-Qaeda safe houses across Afghanistan. His CIA handlers nickname him Ricky, rewarding each fresh tip with cigarettes and other perks. "My father believed one thing," his character says in one scene. "I believe another." The film begins in the days after 9/11, with the Khadrs fleeing their Afghan home just before American troops arrive. Defiant as ever, Abdurahman refuses to jump in the pickup truck with the rest of his family. "Leave him!" his father yells to the others (the script is still being revised, but Maclean's has obtained a draft version). As the movie unfolds, Abdurahman is captured in Kabul, transported to a prison in Bagram, and interrogated by a CIA agent named Michael Gray. After days of sleep deprivation, he finally admits who he really is: the son of Ahmed Khadr, al-Qaeda's "Secretary of State." Abdurahman eventually joins forces with his father's "sworn enemy," working undercover in Afghanistan, Guantánamo Bay and Bosnia. "We caught one of bin Laden's personal guards," Gray, the CIA agent, tells him at one point. "We're going to put you in a cell with him. After a while, chat him up. Get him to tell you where Osama's hiding." "What makes you think he'll tell me?" Abdurahman asks. "You're Ahmed Khadr's son," the agent answers. "It has its benefits. "The script includes more than one flashback to Abdurahman's younger days, including a pivotal memory of his father pleading with him to become a martyr. "So what's it going to be?" his dad asks in one dramatic scene. "Don't ask me this," Abdurahman answers. "I'd never betray you." "That's not the question," dad barks back. "It's the only way to redeem your family name," says another al-Qaeda elder, sitting in the room. "I don't care," Abdurahman pleads. "I'm not going to strap a bomb to myself and blow up a bunch of innocent people." "Shaheeds bring honour to all," his father says. "It's sacrificing the one for the many. It's Allah's will." "It's insanity. ""I'm your father, damn it! And I command you to do it!" What is most compelling about the script is Abdurahman's attempts to have it both ways. He is the disloyal son, more than willing to tattle on his father's old friends to save his own skin. Yet all the while, he repeatedly -- and conveniently -- insists that he never sold out his old man. In fact, when his character first agrees to help the CIA, he demands a concession: "My family is off limits," he says. Later, after his father is killed and his brother is paralyzed, the agents assure him it was not his fault. "Nothing you told us resulted in your father's death, Abdurahman," Gray says. "We had multiple tips." Back in the real world, Abdurahman returns to the apartment, finished his morning cigarette. Moments later, his cellphone rings. He takes the call on the balcony. "He has very different views," Zaynab says. "It's human nature," his mother says. "He always had different beliefs since he was very young." Abdurahman was at McDonald's the night police handcuffed Abdullah and held their mother on the floor. He watched, snapping photos with his camera phone. "He's a coward," Zaynab says. "Why couldn't he tell them: 'Don't touch my mother. You can't do this to her,' " Maha says. "I mean, she's your mother!" The Khadrs have saved all of Omar's handwritten letters from prison, each one asking for their prayers and their love. Some are signed with hearts. Earlier this month, he wrote home to tell his family that he fired his American lawyers. "Please dear mom don't be mad," he wrote. "Allah is our defender and helper." At age 15, Omar Khadr allegedly tossed a grenade that killed a U.S. army medic in Afghanistan. Now 19, he has spent the past four years locked in a cell at Guantánamo Bay, Cuba, charged with murder and aiding the enemy. 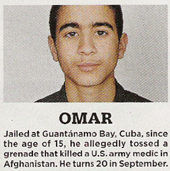 Omar "is a thoroughly 'screwed up' young man," wrote one Foreign Affairs official, who visited him at the seaside prison in 2003. "All those persons who have been in positions of authority over him have abused him and his trust, for their own purposes." Omar's lawyers, including the ones he just fired, claim he has endured bouts of systematic torture: beaten. Drugged. Short-shackled to the floor for hours at a time. Used as a "human mop" to clean up his own urine. The abuse allegations have -- despite his actions and his infamous kin -- transformed Omar into a cause célèbre, Exhibit A of all that is wrong with the war on terror. Not even daddy could have imagined such a public relations coup. But then the Khadrs showed up at the Brampton courthouse, proclaiming their support for the Toronto 17. "Everybody was angry with us again," Maha says. Zaynab has been to every hearing so far, sitting with the wives and children of some of the accused. New to the public spotlight, the others seem to look to her for advice. "These people are Muslims," Zaynab says. "They are my friends. I believe in their innocence, and just like I would love to have someone stand with me when I was in a time of need, I will stand with those people when they are in a time of need. And I will support them. Until they prove them guilty, they are innocent -- by law and by religion." The Khadrs first met some of the accused two years ago, when Kareem returned home. Cheryfa MacAulay Jamal saw the news reports on television and looked up Maha's number in the telephone book, offering any help she could. Her husband, Qayyum Abdul Jamal, is now among the accused, one of the six suspects who allegedly planned to use truck bombs to destroy buildings in downtown Toronto. Two of the group's alleged ringleaders -- Fahim Ahmad, 21, and Zakaria Amara, 20 -- were also friends of the family. Before the arrests, their wives had helped organize fundraisers for the Khadrs. The Globe and Mail has also reported that some of the women were regular contributors to a virulently anti-Western online chat room, where they spoke of holy war and their hatred for Canada. "If he ever refuses a clear opportunity to leave for jihad, then I want the chance of divorce," wrote Amara's wife, Nada Farooq. Earlier this month, Farooq posted a jailhouse letter from her husband. "I beg you," Amara wrote. "DO NOT FEEL SORRY FOR ME. I'm Allah's slave and he does whatever he wishes with me." "They were very nice, friendly people," Zaynab says. "Very, very nice people." She insists she had no indication that her friends were planning an attack. If anything, they only spoke of how difficult it is to be a committed Muslim in Canada, where the distractions of modern life often clash with Islam. "In school, they have to go through a lot of peer pressure just to be a Muslim and be proud of who they are," she says. "They wished that one day they would be able to go through life with their families somewhere where it would be easier for them to practice their religion." As for the charges, Zaynab says the whole thing is "ridiculous." Paintball guns. Ammonium nitrate. Beheading the Prime Minister. "It is just unbelievable," she says. "I don't believe it," Kareem adds. "They are making a fool out of RCMP, CSIS and all the intelligence," Maha says. "If there is somebody planning something, he is out there doing something, and they are capturing all these very naive, young boys." "Yeah," Kareem says. "And whoever is actually doing something is going to do it." "With these guys, now that they're arrested, I'm pretty sure it goes through their mind that they wish they'd done something," Zaynab says, a few minutes later. "To justify all the suffering," her mother adds. "In their minds," Zaynab continues, "maybe it would have been worthwhile that we'd done something, so at least then we'd be punished for something we did, instead of being punished for something we didn't do." Like his three older brothers, Kareem spent time in Afghanistan's training camps, washing clothes and firing Kalashnikovs. "A lot of our friends used to go there, so we were like: 'Dad, I want to go there because of my friends,'" he says. "There is nothing else to do there, right, and those camps were the best way to get out of trouble." Today, Kareem attends a Toronto high school, two years away from his diploma. He spends hours on the computer, follows the NBA (he's a Miami Heat fan) and plays competitive wheelchair basketball. "I'm good," he says, smiling. Recently, he tried out for an all-star rep team, but the coach cut him. He has no proof, though he is pretty sure his last name had a lot to do with it. "They didn't say that," he says, "but there were players that I played better than." "I have been to many games, and he is good," Zaynab adds. "But he's never picked." The West has certainly rubbed off on Kareem. His clothes. His cellphone. Shaquille O'Neal. Like all mothers, Maha worries about her teenage boy, about how much time he spends on the Internet and what he watches on TV. She wishes, too, that he would practise his walking exercises a little more often. But her worries go beyond the typical angst of most Canadian mothers. She dreads, every day, that the Mounties will kick down her door. That Omar will never leave Guantánamo. That Abdullah will be extradited to the U.S. That Zaynab will be arrested. "Every time I'm late, she's calling me, making sure I'm okay," Zaynab says. 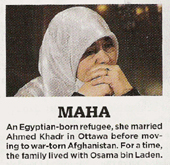 A few months ago, Maha accompanied her granddaughter on a school field trip to the Ontario Science Centre. At the end of the day, the class went to the closet to retrieve their coats. "Only my jacket was gone!" Maha says. "There were 30 kids with their teachers, and only my jacket was gone!" Must have been the infidels. "We can't even talk at home without knowing that everything we say or do is being watched and monitored," Zaynab says. "The phone is bugged," Maha adds. "You feel so helpless." "Can you imagine," Zaynab continues, "that if you ever wanted to say something that you think they don't need to know, that you would have to go outside to say it? It's ridiculous. And we're supposed to be living in a free country." "Sometimes," Maha says, "when I am very, very angry, I say: 'May God punish them severe. Whoever caused Omar and Abdullah this pain, may God punish them so severe.' I'm a mother -- I don't care, you can write this or say it -- I'm really hurt in my heart for my children. And when I see Abdul-Kareem crawling at this age, or having to catheterize and all this mess, I really pray really hard that God punishes them. And when they captured Abdullah that day, I prayed really hard, really loud: 'May God burn your heart!' I prayed so hard, so loud, that I wanted to make sure they hear that. I know many of them don't believe in God or anything. But I do." It is, for the most part, a lonely life for the Khadrs. Years ago, when the kids returned home for a visit, fellow Muslims were envious, impressed that they were willing to leave Canada to help the poor. "All of a sudden now, everybody stays away from the places you go, doesn't want to talk to you, doesn't want to know you," Zaynab says. "Even people who know you pretend they don't." Old friends from Ottawa stopped calling. At the mosque, some worshippers look the other way when they see the Khadrs coming. "I go to school, he goes to school," Zaynab says, pointing at her brother. "We talk to people at the school. But do we have friends? No." "We had friends," Kareem says. "We had," Zaynab agrees. "Now they put them in jail. Whatever friends we had are gone." The Khadrs like to portray themselves as the victims of an Islamophobic conspiracy, one that stretches from the courts of law to the basketball court. They honestly cannot fathom why the RCMP watches them so closely. "I'm one of those persons that if you don't cross my line, I don't cross yours," Zaynab says. "But if people hurt me, if you really cross my line, I probably would." When asked if fellow Canadians should consider her a threat, she laughs. "I wish," she says, quickly correcting herself. "No, I'm not."